After building and launching a great website, collecting and analyzing enough data, it’s time to launch your A/B testing campaign. And when you do, it’s important to remember one crucial rule. The main reason behind conducting an A/B testing is never about the website ecommerce testing itself. It’s about reviewing the test strategies that will help improve your conversion and retention rates within your ecommerce website. The goal of the proper A/B ecommerce campaign is to find the rips and holes in your ecommerce strategy and turn them into successful conversion points. Doing ecommerce website testing mindlessly will not only fail to bring any tangible, useful outcomes but will waste your time, money and company resources. To avoid this, optimize mindfully – find your website’s weak points and turn them into strength. You can do so by using ecommerce testing tool like heatmapping and user recording, described here, to know what you should turn your testing eyesight towards. To help you convert your leads better, we’ve split the top A/B ecommerce Test Ideas, which you can use to develop a test strategy for an ecommerce website and increase your ecommerce optimization, into sections according to the visitor flow. The reason why we stress so much about the right choice of clothes, colours and a haircut, that suit the shape of our face and our body type the best, is because first impressions matter. In fact, they matter so much that a lot of times they become a foundation of all of our future interactions with a given person. Same goes for a website. The most important screen you’ll want to prioritize, and therefore – test, is your ecommerce website welcome screen. Since a lot of times your delivery rules, prices and inventory will vary depending on your visitor’s country, it’s a common practice to welcome your visitors with a “Choose your region” screen. Now how you greet them is what makes all the difference. 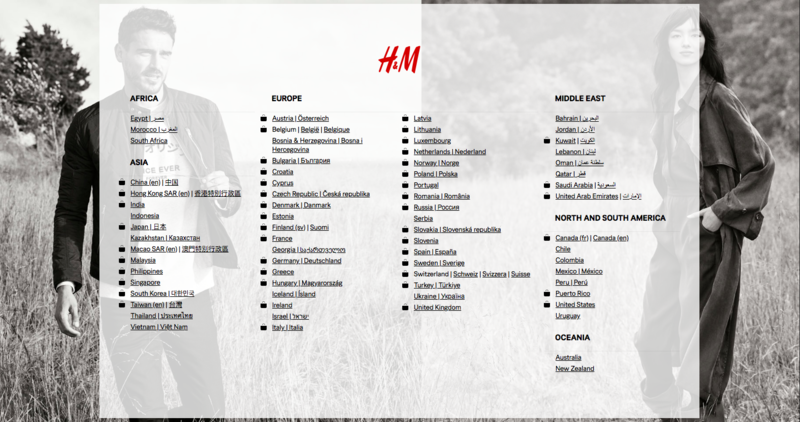 In option 1 you are presented with a whole list of countries that are supported by the H&M website, which is convenient and fast, if say, you’ve been to the website before, and over-cluttered and confusing in case you are a first-time user. 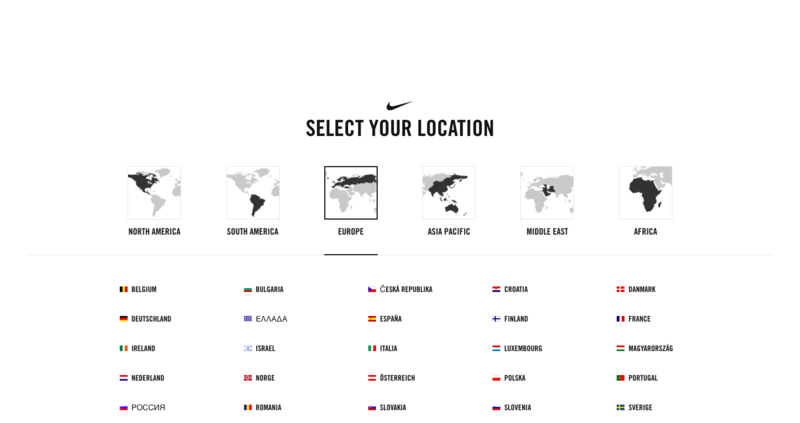 Now in option 2, you are first presented with a clean, minimalistic screen that lists a number of country regions (screen 1), and only once you choose one, say Europe, you can see the whole list of countries you can click on to proceed with your journey (screen 2). Experiment with your split testing to see which one of these options suits your customers better. Websites, that feature their competitive advantages are said to convert their customers better. That includes displaying your free shipping or sale deals, telephone number, and other important info you’d like your customer to view first. It is one of the most convenient options to display those in a narrow header – and here we, too, have options. Rotating header allows to showcase one tasty deal at a time, that is being replaced with another deal a couple of seconds later. In the second option, featuring a stable header, we can see a free shipping deal, a discount and a store-locator all at once. A/B test your header to find out which of two options perform better. Your product has something special about it. It has to, or you wouldn’t sell it. And since you have things to offer, it’s a good idea to showcase them on your website. Now the way you show it can vary. You can display your product’s or service’s selling points in a tasteful way between your product categories and other home page elements, that will display all you are proud to offer without attracting too much attention to it. Or, you can delegate a whole scroll page area to your special sell points. Boldly indicating what your product is all about can help your customers decide in your favour. The only way to find out between these two options is to do a proper ecommerce split testing. Creating the best ecommerce landing pages requires a lot of skill, patience and of course – A/B testing. And even more so when it comes to your product Call-to-action buttons. It has been found by conversion rate experts that a simple change of CTA button colour, text or placement can increase your ecommerce Conversion Rate Optimization by up to 35%! Let’s use an ecommerce online test and ecommerce CRO tools to find out which one suits you better. In option one, we see a relatively small Call-to-action button on a non-aggressive pastel blue colour. This button design is accompanied by an extremely democratic “Add to bag” CTA, which allows a customer to browse more and think-through before making a final purchase. This can be a winning strategy for an ecommerce website, as it gives space to customers who don’t enjoy pressure. 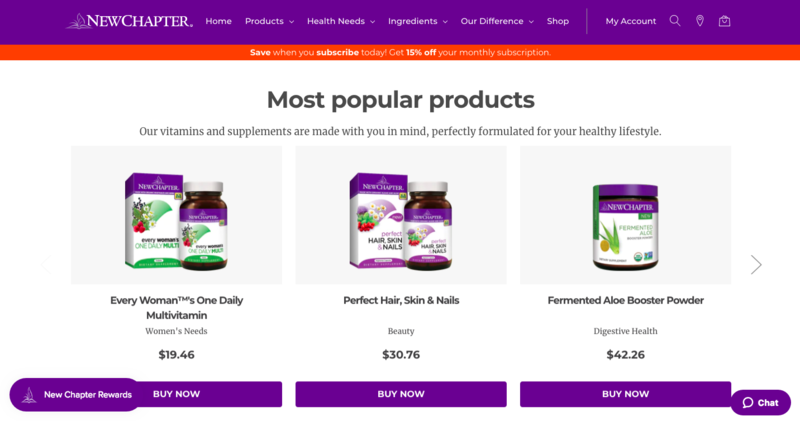 On the contrare, in this ecommerce website testing example, we can see a large Call-to-action button that is marked with a bright purple colour, large size and a conscription “Buy now” slogan. This too can be a winning strategy in an ecommerce A/B testing, as it points a customer directly to the desired action in a bold, fear-free way. When talking about the best test cases for ecommerce websites, we couldn’t leave behind one of the trickiest elements of a good ecommerce landing page – search bar. Why tricky? Because it’s hard to guess what your customers will like without conducting an ecommerce A/B testing. We know for a fact that having autopopulating suggestions in a search bar will increase your ecommerce site conversions. No doubt, getting suggestions while typing in the items you are looking for enables a faster user experience, which is linked to a higher purchasing rate. In other words, the less time the user spends looking for an item, the more likely he is to buy it. Now let’s review these final top A/B ecommerce test ideas to help you define the search bar that suits you better. In option one we can see suggestions being autopopulated as we type, without an image being attached to it. 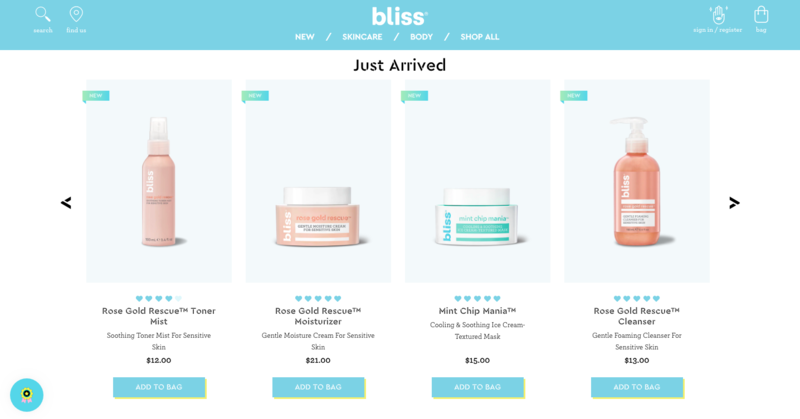 This can be convenient for a multi-item store that sells a large variety of products from different categories, and where accompanying each search result with an image can be distracting and confusing for a website visitor. Option two is more suitable for boutiques, brand and product-focused online stores, that are focused on selling within one niche and can showcase the cohesive thread of images once you type in that search query. Find out which one of two option – with or without images – wins in your ecommerce website testing process. Experiment, test and find out which A/B options turn out to be the best ecommerce conversion rate optimization strategies for your ecommerce website!